Seems that sellers of parts, etc have all really sucked at sending things. I too will be a tad late (sorry james! ) I had a seller never send me parts so I had to try and make up for it. Just waiting for paint to dry completely so I can do finishing touches and get it out! As long as its by the end of the week we should be good! I've got my stuff already and I should be able to send it tomorrow (Monday for me)! I can post pictures of all of it if Erica is okay with it/wants me to, but I'm also happy to keep it a surprise! Jess, I want to be surprised! Keep those pics to yourself:) I'll post some when I get it! I'm almost done now, working on them a lot today! Okie dokies hunny Surprise it is!!! Hehe. Im waiting for Lindseys present but as I say the longer it takes the more excited I get for its arrival. hehe. We need pics of everyones gifts! I'm still waiting for my gift too, and yes- i would LOVE to see pics of what everyone got!! I sent it a while ago! Where the hell is it?! its been lost! I was hoping it was just you were busy and hadnt posted it off yet. I will dig out the receipt and check the tracking to see where it is. I really hope it wasn't lost! I worked hard on it! Maybe it will show up tomorrow! i really need an update from EVERYONE on the status of gifts. Jsebold is sending this week. Oh yay! I'm sooo excited! Correct for me I sent a week ago today! (7 days ago) and it's international post so should be another week or so!!! Erica sent me message on FB and said she was sending it 'tomorrow' a week ago, so hers might be posted as well. Two minis (first I've made) they aren't very good but I put alot of effort it so I hope that counts! Going with the 'dream' theme, it's Buffy and Spike getting married! haha, because Erica is a big Spuffy fan! 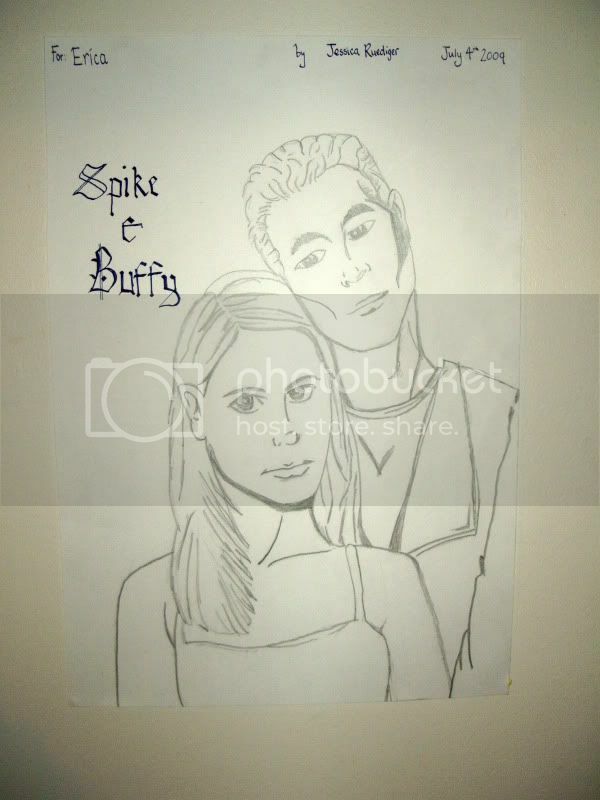 And a picture I drew on A3 Paper in pencil of Spike and Buffy. I love them all! They look so nice and so much care is put into them! 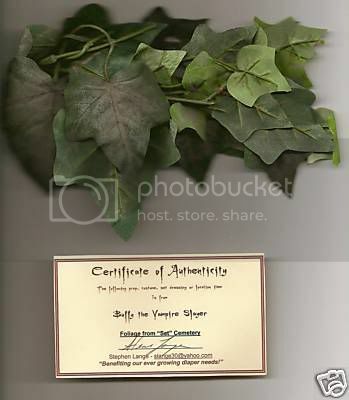 I especially love the faux leaves from the set...my absolute favorite thing!! I LOVE my mini anya, her rollerskates are so cute, and my mum found the mini pumpkin adoreable. haha. Also recieved an angel book, nice timing as Im coming to the end of my current book! Although I couldnt resist and started reading it today.lol. We definitely need to have another one of these swaps, and I think swap partners works a lot more sucessfully than the circle swaps. they can tend to get a tad confusing and this way you can keep in contact with your partner to see whats going on with your gift etc. and another thanks to Lindsey for organising the whole thing. Yay it wasn't lost!!!!!! Glad you liked. My first Mini. She was fun!